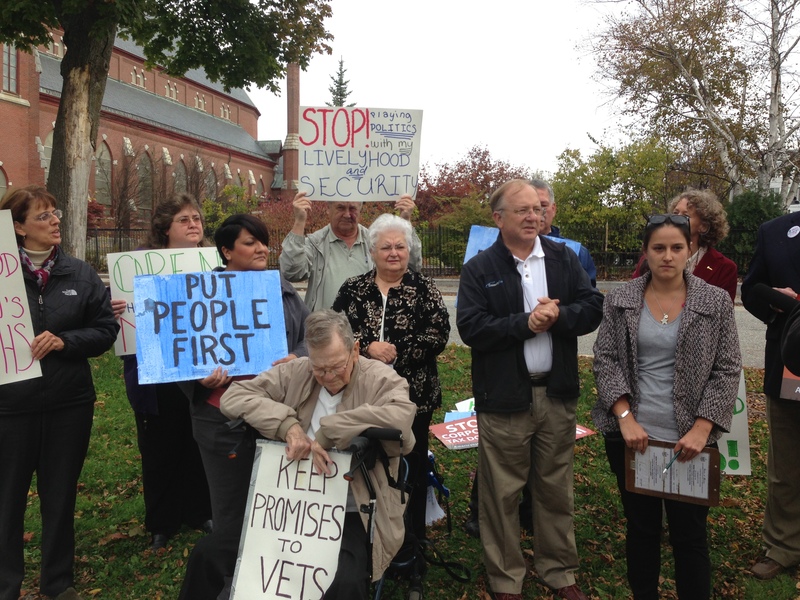 On Wednesday, Lewiston-Auburn residents conducted a walking tour of different locations in downtown Lewiston to detail the effect a prolonged government shutdown is having on various programs that provide vital services to veterans, the elderly, and low-income Mainers. Starting at Kennedy Park, the tour visited several organizations in the Lewiston community that are impacted by the shutdown, including Head Start, Community Concepts, and the B-Street Community Center. A recent study found that Maine is ranked fifth in states most affected by the government shutdown, due in large part to the high number of seniors, veterans and small businesses that rely on federally administered programs. During the walking tour, residents shared their experiences with the shutdown and urged House Republicans to vote to reopen the government. “If the government shutdown is prolonged, it will make it difficult for our federal fuel assistance program to certify applications. Because of the shutdown of the Social Security office, which is needed for income verification, our federal funds for Head Start, Weatherization, and Self-Help Homebuilding could be stopped, and that could cause disruption,” said Michael Burke, director of Community Concepts, an organization that offers a variety of housing, economic development and social services. “We hope that Congress is working hard so that this doesn't happen, and we urge people to contact their federal legislators to tell them of their concern." The event comes as lawmakers in Washington continue to negotiate a deal to reopen the government and raise the country’s borrowing limit, known as the debt ceiling. A bipartisan deal that emerged in the Senate would have extended a timeline for budget negotiations through December 15, re-opened the government through December, and suspended the debt ceiling until early February. This deal was rejected by Republican leadership in the House without putting the measure to a vote, despite considerable evidence that a bipartisan majority would have supported the bill. As of 8:00 P.M. Tuesday, Republicans were unable to propose a plan deemed suitable by the most conservative members of their caucus, and Senate leadership is again working on a deal to avoid breaching the debt ceiling on Thursday. It now seems likely that House leadership will bring this plan to a vote.